"Reminds me of the old school days lunch. YUM! 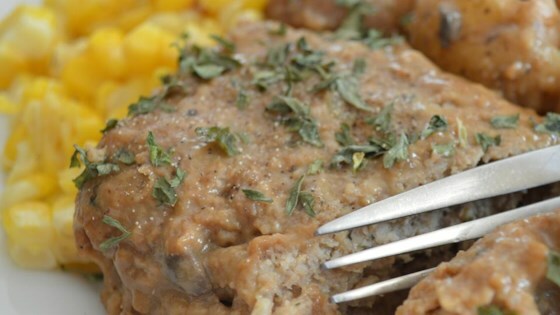 Ground turkey is mixed and then formed into patties which are baked and served with a mushroom gravy." Whisk 1 cup water, onion soup mix, Worcestershire sauce, garlic, and black pepper together in a bowl. Strain mixture, reserving solids and broth. Pour 1/2 cup broth and the solids into a large bowl; mix turkey, bread crumbs, and egg into broth-solids mixture until thoroughly combined. Scoop 8 portions using 1/2 cup measure and form each into an oval patty; arrange on a baking sheet. Bake in the preheated oven until no longer pink in the center and the juices run clear, about 20 minutes. An instant-read thermometer inserted into the center should read at least 165 degrees F (74 degrees C). Whisk remaining broth, mushroom soup, 1 can water, and gravy mix together in a saucepan until smooth; bring to a boil, stirring constantly. Remove from heat. Flip patties and pour gravy over each. Continue to cook until gravy has slightly thickened, about 10 more minutes. we just had this for dinner and it was awesome we loved it. Im always looking for recipes for turkey and this will be a regular with us.thank you for a delicious and easy recipe. This was really good! I followed another reviewer's suggestion and used 2 lbs of meat and an extra 1/2 cup bread crumbs. It wasn't too salty that way, and my 3 kids loved it! DELICIOUS. I used two pounds of ground turkey and added a half cup of bread crumbs besides that I followed the recipe exactly.